Model 400, 300, 600, Etc. Two Spanish firms (perhaps more, but only two responded) were invited by the government to submit self-loading pistols for rigorous testing to become Spain’s standard military handgun. 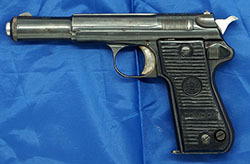 Esperanza Y Unceta (Astra) submitted two different designs, one of which was the Model 400, and Bonifacio Echeverria submitted a pistol which was marked STAR. integral, and the magazine held 8 rounds. 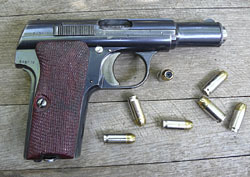 An unusual and unintended aspect of the Astra 400 was that, due to the long case of the 9mm Bergmann-Bayard cartridge, the gun’s chamber allowed a number of other 9mm cartridges to seat and fire in it, including the 9mm Steyr, the 9mm Parabellum, the .38 Auto, and even the semi-rimmed 9mm Browning Long. The .38 Super will chamber and fire, but has been known to crack slides, as it is too powerful for the Astra, and the 9mm Parabellum can also be dangerous due to the radical headspace difference between it and the Largo. In general, use of incorrect cartridges in any gun is dangerous, due to improper cartridge seating. Nonetheless, men in the field probably took advantage of this “feature” in various conflicts, particularly since 9mm Largo ammunition is scarce outside of Spain. The Model 400 was rust blued (as were all Astra pistols up to 1957). The barrel, barrel bushing, safety, slide lock, and trigger were left in the white and given a high polish. The extractor, grip screws, and magazine release were fire blued. Early grips were made of horn, hard rubber, or mottled brown plastic, with the Astra logo on the upper half. Later grips were of checkered wood (some coarsely checked and some finely checked) with no logo. A rare few featured smooth wooden grips. The early Astra logo consisted of the word ASTRA with the sun’s rays at top and bottom and the letter E superposed at the top and U at the bottom. E/U abbreviated the company name, Esperanza y Unceta. In 1926, Esperanza left the firm to start his own business. Afterward, the company was known as Unceta y Compañia, and the logo was changed to have a U at the top and a C at the bottom. 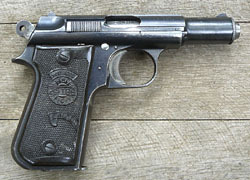 The earliest Model 400s (Type I) had the original E/U logo atop the slide and were marked on the rear slide ESPERANZA Y UNCETA, GUERNICA ESPAÑA, PISTOLA DE 9 m/m, MODELO 1921. Later pistols (Type II, starting in the mid-43,000 serial number range) featured the U/C logo on top of the slide and were marked UNCETA Y COMPAÑIA, GUERNICA ESPAÑA, PISTOLA DE 9 m/m (38), MODELO 1921 (400). There are a multitude of minor variations of the Model 400, with many different proof and acceptance stamps--for details on these please refer to Mr. Antaris’ book Astra Automatic Pistols. Serial numbers were stamped on frame, slide, and barrel. All of the Astra pistols in this family are very tightly fitted, as anyone who has disassembled one will know--the barrel mount and close-fitting barrel bushing make them potentially very accurate. In addition, they are extremely reliable. The major drawbacks of the Model 400 are its heavy recoil spring which makes retracting the slide difficult, and a heavy trigger pull. It remained the standard Spanish military sidearm until 1946. This scaled-down version of the Model 400 appeared in 1923 and was virtually identical to its predecessor in functionality. Chambered for the .380 ACP (9mm Kurz) or the .32 ACP (7.65mm), its small size, accuracy, and reliability made it an instant success. 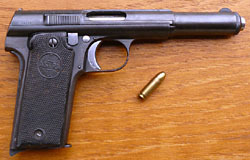 The Model 300 was never an official military pistol, but it was often preferred to the larger 400, and was widely used by Spanish prison guards, port security, the coast guard, the police school in Madrid, various security guards, the Carabineros, the army artillery corps, and private individuals. Toward the end of the Spanish Civil War the German Condor Legion joint task force ordered Astra Model 300 pistols for their pilots. This is the infamous force whose craven bombing and strafing of Guernica on April 26, 1937 destroyed three-quarters of the city but spared the Astra factory. Subsequently, nearly half the total Model 300 production was sold to the German military during World War II--85,390 pistols (63,000 in .380 and 22,390 in .32). Total production of the Model 300 was 153,085. The magazine release on the Model 300 was moved to the lower left side grip. Otherwise, the gun is nearly identical to its larger predecessor. Just as with the 400, there are two types of the Model 300. Type I bear the Astra E/U logo atop the slide and are marked ESPERANZA Y UNCETA, GUERNICA ESPAÑA, MODELO 300. Pistols manufactured in 1924 are stamped with that date on the slide. Beginning in 1929, Type II pistols bear the Astra U/C logo atop the slide and are marked UNCETA Y COMPAÑIA S.A., GUERNICA ESPAÑA. 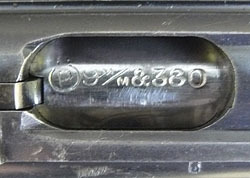 Antaris states that Type II Model 300s were stamped with UNCETA Y COMPAÑIA S.A. on the frame under the left grip, along with the last three digits of the serial number. However, my Model 300 only has the serial number digits in this location. 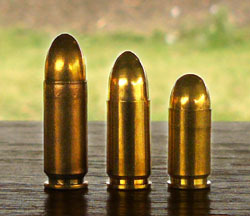 The .380 version of the Astra Model 300 holds 6 rounds, while the .32 version holds 7. The .380 magazine is unmarked; the .32 magazine is marked 7.65mm. Some .380 barrels are marked 9m/m Kurz, while some are marked 9m/m & 380. The .32s are marked 765 m/m. Serial numbers are stamped on the right slide and frame. Barrels are stamped on the bottom with the last three digits of the serial number. My own Model 300, which was one of the first 6000 shipped to the Nazis, is beautifully finished and reasonably accurate, with a relatively light trigger pull. The left grip cracked from the screw hole down to the bottom of the grip--the single grip screw is obviously set too close to the edge of the grip--this may be the one design flaw on the Model 300. Spain was ostensibly neutral in World War II, but favored the Axis powers. In 1941, Astra sold 6000 Model 400 pistols to the German military (along with the first order of 6000 Model 300s). They also shipped larged quantities of 9mm Largo ammunition with the pistols. But under wartime exigencies the Germans often had to use their 9mm Parabellum ammunition in the Model 400s. The shorter cartridges didn’t seat properly in the long chamber of the Model 400 and sometimes failed to feed or eject. Eventually the Germans asked Astra to rechamber the pistol to handle the 9mm Parabellum cartridge. By 1943 the Model 600, chambered for the 9mm Parabellum, was in production, and the first 10,450 guns were delivered between May and July of 1944. Due to the Allied forces invasion of Southern France, the second order was never delivered, and the remaining production of the Model 600 was ultimately sold commercially. A total of 59,400 Model 600s were produced. The Model 600 is 15 millimeters shorter than the Model 400, but has a slightly longer grip, though both magazines hold 8 rounds. The Model 600 used the same magazine release button as the Model 300, which differed from the one on the base of the Model 400 grip. Production standards were not comprimised. The Model 600 was extremely well made and well finished, as were all Astra pistols. Gangarosa suggests that the Model 600s may have been even better finished than other Astras in an effort to please the Germans who were accustomed to a very high standard of manufacture. Model 600s to the mid 15,000 serial number range were stamped with the Astra U/C logo on the top forward portion of the slide, and the rear slides were marked UNCETA Y COMPAÑIA S.A., GUERNICA ESPAÑA. The barrels of these early pistols were stamped PIST PATR 08. Later Model 600 pistols did not have the Astra logo at all, and were marked on the rear of the slide UNCETA Y COMPAÑIA S.A., GUERNICA ESPAÑA, “ASTRA” MOD. 600/43, 9mm PARABELLUM. Some later barrels were stamped 9m/m. The first group of Model 600s (up to serial number 10,500) which were delivered to the Nazis were given a Waffenamt inspection proof consisting of a stylized eagle over WaAD20. Later production guns which were exported were usually stamped MADE IN SPAIN. In 1945 the Astra company updated the Model 400 by lightening the slide, giving it a curved backstrap, moving the magazine release to the left side grip (as on the Models 300 and 600), and providing a loaded chamber indicator pin beneath the removable rear sight. Only 19 Model 700 prototypes were made, as the Spanish military did not approve the pistol for use. 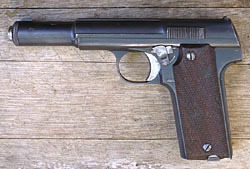 In 1946 Astra began making this updated version of the Model 300, with a grip that swelled near the bottom, a pushbutton magazine release just behind the trigger on the left side, and a loaded chamber indicator. The gun was offered in .32 ACP (7 .65mm) and .380 ACP (9mm Kurz). It was discontinued in 1956, with a total production of 44,389. The Model 3000 never achieved the same popularity that had been enjoyed by the Model 300. It was replaced with the Model 4000. In 1956 Astra introduced the Model 4000, also designated the “Falcon.” Its primary innovation was an external hammer and the elimination of the grip safety, though the gun retained the grip shape and magazine release of the Model 3000. The rear sight is dovetailed in, making it adjustable for windage. Due to its grip tang and widened lower grip, the Model 4000 is about 2/10 inch longer than the Model 300, but the barrel length is the same. The grip height on the 4000 is a slightly greater than the 300 (by maybe a tenth of an inch), and the magazine holds one more round than its earlier counterparts (7 rounds of .380 or 8 rounds of .32). Sales of the Model 4000 were never robust in the U.S., and after 1968 the gun could no longer be imported. However, sales were good in the rest of the world, and the gun was particularly popular in the Middle East. It was discontinued sometime around 1986. Early Falcons were fitted with black or brown checkered plastic grips with the Astra logo and the word “Falcon” in a scroll. Later grips were checkered walnut with an Astra medallion or plain black checkered plastic. Markings vary somewhat over the production range, but most have some variation of “ASTRA Mod. 4.000, ASTRA Unceta y Cia S.A., Guernica-Spain” or “ASTRA, MOD. FALCON” on the rear portion of the slide, as well as the usual Astra logo on the slide behind the front sight. The Model 800, also known as the “Condor,” was a redesigned Model 600, chambered for the 9mm Parabellum. It was originally designed in the mid-1940’s, at the same time as the Model 700, but actual production did not get under way until 1958. As with the Model 4000, the primary innovations were the external hammer and the elimination of the grip safety. The magazine release was a button located in the lower rear corner of the left grip (like the Models 3000 and 4000). The safety lever was moved to the tang behind the left grip plate. The grips were serrated black plastic, featuring the Astra logo and the word “Condor.” The gun was discontinued in 1968, with a total production run of only 11,432. Depress the barrel bushing with the lip of the magazine floorplate and turn the bushing lock 1/4 turn. Carefully ease the bushing and lock off the slide, and remove the recoil spring. Draw the slide fully to the rear, then move it forward slightly and engage the manual safety. Rotate the barrel counterclockwise (as you face the front of the gun) to the limit of its movement. Release the safety and draw the slide and barrel off the frame. Copyright 2008 & 2009 by Ed Buffaloe. All rights reserved. Astra Automatic Pistols, by Leonardo M. Antaris. Firac, Sterling, Colorado: 1988. “Astra Models 400, 600, & 300,” by Robert T. Shimek. The Big Book of Surplus Firearms, Petersen Pub. Co.: 1998. 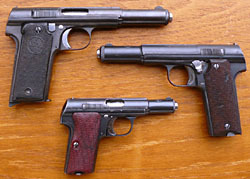 The Evolution of Military Automatic Pistols, by Gordon Bruce. Mowbray, Woonsocket, RI: 2012. Pistols and Revolvers, by Walter H.B. Smith. Military Service Pub. Co., Harrisburg, PA: 1946. Spanish Handguns, by Gene Gangarosa Jr. Stoeger, Accokeek, Maryland: 2001.